The Bathing Pavilion at Sunnyside in July of 2012. The building was opened to the public in 1922. During the dreary days of Toronto’s mid-winter, it is pleasant to recall the times I spent as a child under the hot sun at Sunnyside Beach. During the 1940s, one of the highlights of the summer was a visit by streetcar to the sandy shoreline beside Lake Ontario. In this decade, Sunnyside was the location of the city’s largest amusement park. Known as “the poor man’s Riviera,” it is a pity that it has completely disappeared from the scene. My father arrived in Toronto as an immigrant in 1921, and the following year, glorious Sunnyside officially opened as the city’s new amusement park, adjacent to the beach that had been an attraction for generations. Prior to the opening of Sunnyside Amusement Park, the main amusement park was located on the Toronto Islands, at Hanlan’s Point, known as “Canada’s Coney Island.” It included the city’s baseball stadium, where Babe Ruth hit his first homerun. In 1926, the Maple Leaf Team relocated to the mainland, at the foot of Bathurst Street. This was necessary as fewer people were visiting Hanlan’s Point after Sunnyside opened. The area that we know today as Sunnyside was annexed to the City of Toronto on 22 January 1888. Sunnyside stretched from Humber Bay in the west, to Roncesvalles Avenue in the east. The name Sunnyside was derived from the summer home of John G. Howard, who in 1848, built a modest structure in the area. He named it Sunnyside,” as it was on the “sunny side” of a grassy hill, a short distance north of the present-day Queensway Avenue. The structure was located between Glendale and Sunnyside Avenues. However, Howard’s main residence was further west, in High Park, and was named Colborne Lodge. On the site of Howard’s Sunnyside Villa, in 1876, the Sisters of St. Joseph’s Sacred Heart built an orphanage that they named the Sacred Heart Orphanage. Howard’s Sunnyside Villa was retained by the orphanage as an office. The villa survived until 1945, when the villa and orphanage were demolished to construct St. Joseph’s Hospital. By the year 1900, Toronto had expanded westward, and the land to the north of Sunnyside was becoming increasingly populated. At Sunnyside, there was a narrow wooden boardwalk alongside the sandy beach, and on the other side of the boardwalk, the old Lake Shore Road. As the 20th century progressed, Sunnyside increasingly became a favourite place during the summer months for Torontonians to stroll the boardwalk or have a dip in the waters. One of the most popular bathing spots was at the foot of Roncesvalles Avenue. Around the year 1910, the City of Toronto Councillors began discussing the possibility of building an amusement park at Sunnyside, at a projected cost of $19 million. It necessitated reclaiming land from the lake through landfill. The project was finally approved and the work began in 1913, but unfortunately the outbreak of the First World War interrupted the project. The landfill work commenced again in 1918, and by the time it was completed, over 1400 acres of land had been reclaimed from the lake. The landfill was derived from the dredging of the Toronto Harbour and Humber Bay. The city’s new amusement park was opened by Mayor Mcguire on June 28, 1922. The project was not finished, but the Bathing Pavilion and Amusement Park had been completed, along with 75% of the western section of the landfill. During the next few years, over 200 more acres of land were added. To create a protected area for bathers, a short distance from shore, a 17,895 feet break wall was built, providing a hundred acres of protected waterways for swimmers. The break wall remains to this day. The first year Sunnyside was open, thousands of people descended on the amusement park to enjoy the enlarged beach, and stroll the newly-built 20-foot wide boardwalk. Many others visited the Canoe Club. Included among the popular attractions were the concession stands, which rented beach chairs, as well as those that sold root beer, popcorn, and hotdogs. Sunnyside also possessed a drug store, a dance pavilion, guess-your-weight scales, souvenir stands, an open-air theatre named the Band Stand, a delicatessen, sight-seeing services, and a shoe-shine shop. Originally, seven amusement rides were approved by the city, including the Whip, Aero Swing, two other low-level swings, Dodgem ride, the Frolic and a Merry-Go-Round (carousel). Nine games of chance were approved – Monkey Racer, Coney Racer, a shooting gallery, Kentucky Derby, Torpedo Race, Balloon Race, and Figure 8. There were also ten food stands, several boat rentals, and some high-powered telescopes. Sunnyside also became the site of the annual Easter Parade, where Torontonians displayed their new spring outfits as they strutted along the boardwalk. The 1930s and 1940s were the height of Sunnyside’s popularity. Even the wealthy who owned large cottages in Muskoka paid a visit to the amusement park when they were in the city. Fireworks displays and the burning of old sailing vessels attracted crowds in the evenings. A ladies’ softball league played their games at Sunnyside, and well-known entertainers performed at the Bandstand. Beauty pageants attracted a diverse crowd. Every weekend during the summer months, families departed early in the morning to spend the day at the famous beach. The smell of popcorn, hot dogs, frying onion at the food stands, as well as the cries of the barkers for the games of chance, and the click-clack of the amusement rides, were all a part of the symphony of Sunnyside. 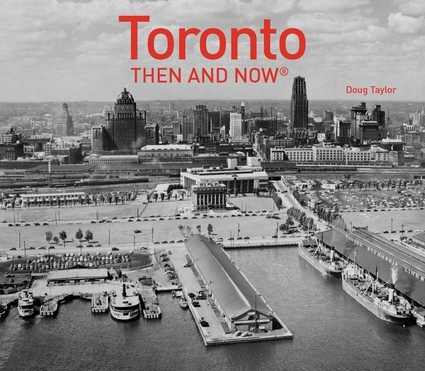 During the 1950s, as automobiles became more affordable, Torontonians took to the highways and Sunnyside was less attended. In 1955, the Toronto Harbour Commission ordered the demolition of Sunnyside. By the end of 1956, the demolition had been completed. For those who had enjoyed Sunnyside as a retreat from the hot humid streets of the city, a glorious era had ended. All that remained were the fond memories. The site of Sunnyside is now buried beneath the Gardiner Expressway or a part of the expanded Lakeshore Boulevard. I am grateful to Mike Filey and his book “I Remember Sunnyside.” (published by Dundurn Group in 1996) for some of the information contained in this post. A 1920s postcard of Sunnyside amusement park and the famous boardwalk. The view faces west toward Humber Bay. The famous boardwalk is on the left of the photo. The lake is to the left of the boardwalk, but is not visible. The large circular building with the red roof is the merry-go-round. Crowds in 1920 on the beach in front of the Bathing Pavilion, watching a regatta. Toronto Archives, S1257, S1057, Item 090. Sunnyside Beach and Bathing Pavilion in 1970. Photo from the City of Toronto Archives, F0124, fl0003, id 0027. This photo from the City of Toronto Archives, taken in 1910, is of the grand home of Dr. W. W. Ogden, at 170 Spadina. It was located on the west side of the street, a short distance north of where a McDonald’s restaurant is located today, at the corner of Queen and Spadina. The McDonald’s postal address is #160. Unfortunately, the Ogden mansion was demolished. Dr. William W. Ogden’s name remains alive today in the city of Toronto as the school at 33 Phoebe Street is named after him. Phoebe Street is located on the east side of Spadina Avenue, two blocks north of Queen Street, almost directly across from where the Ogden mansion was once located. Dr. Ogden served as member of the Toronto School Board for 43 years, and was the Chairman of the Board in 1876, 1877, and 1908. Ogden was born in 1866, one year before Confederation, and died in Toronto in 1910. The first school built on Phoebe Street opened on 16 April in 1855, and was named Phoebe Street School. In that year, the Queen/Spadina area was heavily residential, and the school soon became one of the largest in the city. An addition was added to the structure in 1868, and another in 1890. In 1905, a fire damaged a section of the school, and it was decided to build a new school rather than repair the old. The new school opened in 1907 and was renamed Ogden Public School, in honour of Dr. Ogden. The above photo of Ogden Public School was taken in 1907, the year the school opened. However, as the neighbourhood surrounding the school became less residential and increasingly commercial and industrial, enrolment declined. The impressive old building was eventually demolished, and a new 14-room school was opened on 12 December 1957. Today, the school maintains an excellent reputation and possesses a “naturalized playground” for its pupils. It is a delight to behold during the months when it displays its greenery, an oasis within the city’s mainly concrete environment. The Ogden Public School of today, tucked behind the busy intersection of Queen and Spadina. The naturalized playground on the north side of the school. Another view of the naturalized playground. Living in downtown Toronto, I have become very conscious of graffiti mural art and graffiti in general. In Puerto Vallarta, a well-known restaurant, “Cafe des Artistes”, has painted the building that houses it with brightly painted mural art. It has attracted much attention from the locals and tourists alike. Viewing this photo of Spadina Avenue, with its bustling retail shops, set amid modern and 19th-century buildings, it is difficult to visualize it as a quiet rural avenue that extended through land recently reclaimed from the heavily wooded forests of Upper Canada. The creator of the wide avenue that today we call Spadina was Dr. William Warren Baldwin. His wife Phoebe and his sister-in-law, Marie Willcocks (nee Baldwin), owned the land. The sisters had inherited the property from their cousin, Elizabeth Russell, sister of Peter Russell. However, it was Baldwin, in his capacity as adviser to the two women, who originated the idea for a grand avenue extending through the property. Dr. Henry Scadding, in his book “Toronto of Old,” stated that the width of the roadway was to be 160 feet throughout its mile-and-a-half course. However, it was actually 132 feet. Construction on the avenue commenced in 1815. In the early decades of the nineteenth century, the portion of Spadina south of Queen Street was named Brock Street, after Sir Isaac Brock, killed at the Battle of Queenston Heights. Spadina commenced at Queen Street and extended as far north a Bloor. As the 19th-century progressed, modest homes were constructed along the street. They were cottage-like in appearance, and possessed small kitchen gardens, since these families were living a considerable beyond the boundaries of the town of York. It was huddled close to the lake, and to the east of where Spadina Avenue exits today. In the modern era, It is difficult to think of the area around Spadina as being remote, as it is now in the heart of the city. This sketch, drawn from memory by R. L. Mulligan, depicts Spadina Avenue as Mulligan remembered it in his boyhood days, in the mid-1860s. At that time, there were only a few scattered houses along the avenue, surrounded by open land. The section of the street that is today named Spadina Circle, contained market gardens. In the bottom, right-hand side of the sketch is an open area (common), employed for training and reviewing the militia. Artist’s painting of the troops being reviewed on the military common on the site of the present-day southeast corner of Spadina and College Streets. This section of Spadina is between St. Patrick Street (Dundas Street West) and St. Andrews. Spadina Avenue in 1870, south of College Street, looking north. The brick building in the background, which is under construction, is on the northwest corner of College and Spadina, the site of the future Waverley Hotel. Close-up view of the northwest corner of College and Spadina in 1870. Home on the west side of Spadina in 1885, between Dundas Street and the alleyway named Glen Baillie Place. Horse-drawn streetcar on Spadina Avenue in 1890. By this decade, many fine homes had been built on the avenue, one of them seen in the background. Northwest corner of College and Spadina in 1895, and one of the first electric streetcars in Toronto. Building in the background was the YMCA, which later was the first building occupied by the Waverley Hotel. Looking north on Spadina at College Street c. 1915. Today, the Spadina Avenue that Baldwin created has many Asian and fusion restaurants that are enjoyed by tourists and residents from all over the city. The sketches and photographs in this post are from the collection of the Toronto Reference Library, except for the final photograph, which is from the City of Toronto Archives. The Robertson building at 215 Spadina Avenue is an architectural gem located among the many warehouse/loft structures on Spadina, between King Street West and Dundas Street West. The five-storey structure was built between the years 1911 and 1913 to accommodate the needs of James Robertson and Company, which moved into their new building from their former location on King Street. The firm manufactured and distributed plumbing fixtures. The architects were Denison and Stephenson. The exterior walls of the building are of attractive red bricks, the 100,000 square-foot interior containing douglas fir support posts and beams, as well as magnificent pine flooring. The building was purchased by the Urban Property Group in 2002, and has been meticulously renovated and restored. The 250-square-foot bio-filter green wall in the lobby contains a myriad of plants, with a constantly flowing waterfalls. These features reduce the contaminants in the air that float inside the building from the traffic on Spadina Avenue. The filtered air is circulated throughout the entire five floors. The building also has a 4000 square-foot roof garden that features Ontario wild flowers. Sadly, I have never had the opportunity to view the garden. The present-day owners provide an excellent web-site that explains the history of the Robertson Building, and also placed signs in the lobby to provide pertinent information. The building today is home to many tenants, perhaps the most visible being the Dark Horse Espresso Bar on the ground floor, facing Spadina Avenue. It is worth a visit, not only for the great coffee, but to see the interior of the cafe. The coffee beans for a customer’s order are not ground until the order has been placed. The flavour of the brew more than justifies the few moments delay. The Urban Property Group is to be highly commended for their sensitive restoration of this historic building, which otherwise might have been demolished, as has been the fate of so many of Toronto’s architectural gems. The Robertson Building in 1920 – photo from City of Toronto Archives. The building is on the east side of Spadina, between Queen Street West and Dundas Street West. Pictures such as this one never cease to amaze me, as it is difficult to picture any main street in Toronto with so few automobiles. Modernized doorway to 215 Spadina and detailing above the doorway. The west facade of the building, the Dark Horse Espresso Bar evident on the ground floor. The cement and stone trim on the ground floor greatly enhance the building. In summer, the space in front of the building has attractive flowers, which I believe, are provided by the building’s owners. The bio-filter green wall in the lobby. It is worth visiting the building to view this installation, particularly in winter, when the street outside is so bleak and colourless. Douglas fir beams and a small section of the plank ceiling are also visible. Lush vegetation is maintained year-round in the bio-filter green wall. The door in the lobby that leads to the Dark Horse Espresso Bar, and the serving area in the cafe. The Robertson Building on a hot summer night. Toronto’s architectural gems– Lord Lansdowne School on Spadina Cres. Lord Lansdowne Public School is located on the west side of Spadina Crescent. Its unusual round shape and the colourful panels beneath the windows are striking, often attracting the attention to those who walk past it or view it from the Spadina streetcars. However, a Victorian-era school was previously located on the site. It opened in March of 1888, and contained 945 pupils. This attendance figure indicates the degree to which the area was populated during the later decades of the 19th century. From the day the school opened, its was over-crowded. The Victorian building that opened in March of 1888, with its ornate tower that dominated Spadina Crescent. A small Second Empire-style house can be seen to the south of the school. The west section of the school facing Robert Street, where the main entrance of the building is located. When the old Victorian school opened in 1888, it was over-crowded. As a result, an addition was added to the ornate structure the following year. The population of the area continued to increase, so another addition was added in 1909. A fire damaged the building in 1913, necessitating much rebuilding. Eventually, more land was purchased on Borden Street by the school board, and in 1961, the old Victorian structure was demolished, replaced by the school that remains on the site today. At this time, the school’s name was changed to Lord Lansdowne to avoid confusion with another school, which was located on Lansdowne Ave. The new school was designed by Toronto’s Board of Education architectural and engineering staff. A round building was thought to be more economical and functional as it made better use of the land. This massive rock is located on the lawn of the school, near the fence, on the east side that faces Spadina Crescent. This plaque on the rock explains the reason it remains on the grounds of the school. It does not indicate if the rock was found during the excavation for the Victorian structure or the school that was built in 1961. The seven-storey Reading Building at 116 Spadina Avenue is located on the northwest corner of Spadina Avenue and Camden Street. Constructed in 1925, it is a solid concrete structure with an attractive red-brick exterior containing a magnificent “brick and beam” interior. It was built as a warehouse loft to accommodate the needs of Toronto’s garment trade during the 1920s. The architect was Benjamin Brown, and it is the least ornate of the structures he designed on Spadina Avenue, the Tower Building (1927) and the Balfour Building (1929-30) being two other examples of his work that are located close to the Reading Building. Brown also designed the Victory Theatre that at one time occupied the northeast corner of Spadina and Dundas Street West. The theatre is long gone, but the building remains. Unlike its sister buildings, The Reading was no traces of Art Deco in its cornice. The rectangular windows are inset into plain facades that have strong vertical lines to increase the appearance of height. The first and second-floor levels have impressive stone trim that enhances its appeal for those walking past it on Spadina Avenue. This 1921 photo from the City of Toronto Archives shows the southwest corner of Spadina and Camden Street, the future location of the Reading Building. The Darling Building is visible to the south. The ground floor of the Reading Building facing Spadina, where several retail shops are located. The stone trim on the first and second floors level greatly enhance the building. Modern entrance to the Reading Building, surrounded by the original stone work. The east facade of the building facing Spadina Avenue. The stone work on the first two storeys in visible. North facade of the Reading Building, facing Camden Street.